This song book, with "20 favorite songs Gene Autry Sings," was released by Gene Autry's Western Music Publishing Co. in 1946. The cover has a photo of Gene Autry and the original Hollywood address of the music company. 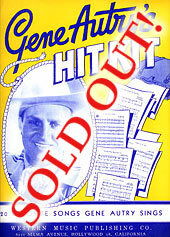 In addition to the sheet music, this song book has introduction greeting from Gene and several pages of "doublespread pictures" in black and white of America's Favorite Cowboy, Gene Autry. This item is out of print and sold out.